The major cell phone carriers charge iphone users approx $90 per month for cellular and data services on an iphone. At least one pre-paid carrier offers cellular and data services for iphone owners at $45 per month ($50 with taxes, or about $42 with taxes if prepaying one year). That pre-paid carrier is Straight Talk, which appears to be a partnership between Walmart (retail), Net10 (an experienced pre-paid carrier), and AT&T (cellular network), offering pre-paid services on a number of smartphones and other cell phones. (I am no expert on the partnerships, but my son has his iphone4 on straightalk and I see obvious fingerprints of all three partners). Despite the 100% price difference, both marketing and setup costs are preventing most iphone users from switching away from the major carriers. On the marketing side, Walmart and Straight Talk are pretty quiet about the fact that iphone users can use their $45/mo service (did their AT&T partner pay them to be quiet?). Even cnn.com had a story claiming (incorrectly) that, as of today, none of the pre-paid carriers are available for iphone users. Obtain an AT&T compatible iphone (new or used). I don't think you can buy one at Walmart without signing up with AT&T or Verizon, but many other places cell them contract free. Purchase a $15 AT&T compatible micro-sim card from Straight Talk and insert it into iphone. Activate the micro-sim with Straight Talk (if you had a phone number from another carrier that you previously were using with iphone or any other cell phone, at this stage you can assign it to the micro-sim). It may take up to two days from the time that you activate and the time that your iphone can begin to place and receive calls and/or text messages. At this stage you pay your $45. Set the APN numbers on the iphone to work with Straight Talk (this step is necessary to use data services). One way to do this is to connect iphone to wifi and then go to go to http://www.unlockit.co.nz, and the iphone will automatically adopt the proper APN numbers. Update Oct-2013: follow these instructions to get your iphone to automatically adopt the proper APN numbers. I suspect that knowledge of these steps will diffuse pretty quickly, and in less than a year major carriers will have to reduce their monthly cellular charges to be much closer to Straight Talk. Update Oct-2013: I did not correctly predict AT&T's pricing. It appears that AT&T is actually charging a bit more (eg., no more 200-MMS packages) than they used to. Update Jan-2014: AT&T has finally moved prices a lot closer to Walmart. By one measure, the labor market has not recovered at all. By another, the recovery is complete. The red line in the chart below is a monthly index of the employment-to-population ratio, normalized to a value of 100 in December 2007, when the recession began. In this series, each employed person counts the same, regardless of how many hours she or he works. Federal Reserve Bank of St. LouisAverage weekly hours of private employees (blue line) have returned to the level last seen before the recession of 2008-9, shown as gray area. But the percentage of Americans with jobs (red line) plummeted in the two years after the recession began and has remained steady since then. The employment-to-population ratio fell more than 5 percent during the official recession period and fell almost an additional 2 percent in the second half of 2009. The ratio has been essentially constant since then; there has been no meaningful increase in the fraction of Americans who are employed. The blue line shows the average number of hours worked by people with jobs in the private sector. In this series, only people with jobs are included in the calculation. The hours series reflects a large contraction of more than 2 percent during the recession years. In other words, a number of employees found that their hours were cut during the recession and that long-hours jobs like construction were lost to a greater degree than short-hours jobs. Unlike the employment-to-population ratio, average work hours have largely recovered since 2009. Earlier this year, the average hours series reached 100, which was its value for much of 2007. To put it another way, 93 percent of the people who would have been employed in an economy such as we had in 2007 are employed today and are likely to feel that they are as busy with work today as they were then. The other 7 percent are not working at all. 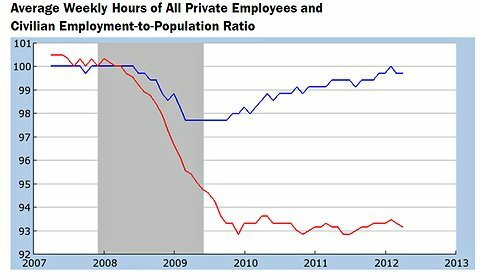 There are several theories as to why the recovery has been so asymmetric in terms of hours and employment. One is that the unemployment insurance program, eligibility for which has expanded significantly since 2007, pays people to be without a job but usually does not pay them for having reduced hours. Thus, unemployment insurance does more to prolong joblessness than it does to prolong working at reduced hours. Another theory is that actual or anticipated health insurance costs discourage employers from having too many employees; instead, they accomplish their tasks by having existing employees work longer hours. Because health insurance costs accrue on a per-employee basis, an employer with, say, 38 employees working 40 hours each has the same total number of work hours as an employer with 40 employers working 38 hours each, but the former employer’s health insurance costs are 5 percent lower. Yet another theory is that employers are concerned that their economic conditions may change quickly and find it easier to adjust work schedules than to adjust the number of employees. And still another theory notes that the employment-to-population ratio would have fallen even without a recession as baby boomers reached retirement age. At the same time, those retirements might not reduce average work hours among those who had not yet reached retirement and might even increase them. In any case, it is worth monitoring the separate recoveries for employment and for hours, as they can shed light on supply-and-demand factors that caused the recession and have prevented a full recovery by all measures. On the 12th of this month, unemployment benefits were terminated for persons living in Illinois who had so far been unemployed and collecting benefits for 79-99 weeks. The New York Times interviewed one of the persons affected, Candace Falkner, 50. Persons, like Ms. Falkner, who are unemployed for 79 weeks or more are often described as being unable to find a job. They would never turn down a job just because they were receiving unemployment benefits. Yet, according to the New York Times, Ms. Falkner is working now, only a week or two after her unemployment benefits ran out. With no jobs to be found for the prior 79 weeks, did Ms. Falkner's job coicidentally appear? The story describes Ms. Falkner's new job as "a commission-only, door-to-door sales job," and describes Ms. Falkner as a person with a master's degree, so I think we are to understand that Ms. Falkner is qualified for a better job than that. If so, it seems the 79+ weeks that she was unemployed cannot be described as a time when there were no jobs to be found, but rather a time when there were no "good" jobs to be found. That's exactly the story I have been telling on this blog for several years: unemployment insurance makes unemployment last longer, even while it goes to people in unenviable situations. It also raises wages, as the jobs that are not good enough for the unemployed to accept either go unfilled or are not created in the first place. Perhaps these consequences are desirable or at least tolerable for the intrinsic benefit of knowing that taxpayers are helping people when they experience tough times. But they are consequences nonetheless: the fact is that some of the reason that the unemployment rate is 8 percent rather than 5 is that unemployment is subsidized. Sometimes Republicans and Democrats are like Coke and Pepsi: a lot more different in marketing than they are in substance. Aging, changes in the health sector and the recession all serve to increase what the government spends on social welfare programs. Republicans and Democrats both acknowledge that some kind of adjustment is needed to bring the amount the government spends in line with the amount that it taxes. Republicans are more apt to say that spending needs to be cut in order to match government revenues that are currently less than spending. Indeed, many of them have taken a “no new taxes” pledge. Democrats are more apt to consider raising revenue to help pay for the cost of social spending. To the degree that Republicans propose to cut spending by means-testing programs that were formerly provided to all income groups, there may be little or no economic difference between Democratic and Republican proposals. Take, as an example, Medicare, the health-insurance program administered by the federal government primarily for people 65 and older. It is a universal program, rather than an antipoverty program: all citizens can receive benefits from the program when they become old, regardless of how rich or poor they are. To simplify the arithmetic, suppose the medical goods and services provided cost an average of $11,000 a year per beneficiary. The government could provide Medicare free of charge, in which case each beneficiary effectively receives $11,000 in premium assistance from the public treasury in order to pay for the cost of the program. The premium assistance by itself tends to increase the government deficit in proportion to the size of the older population, because the government has to pay for the medical goods and services. One idea, close to some Republican thinking, is to reduce the deficit by cutting government spending by “means-testing”: limiting the assistance to people who cannot afford to pay the premium themselves. The universal and means-tested approaches are shown in blue and red, respectively. The horizontal axis shows annual income ranging from zero to $120,000 a year. 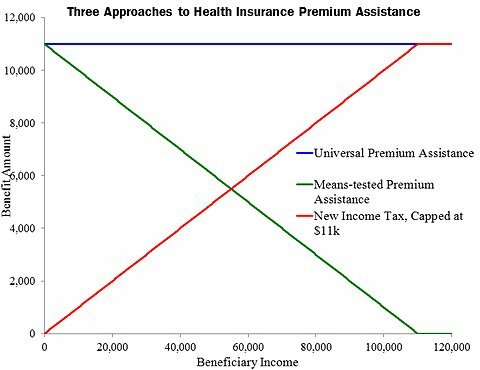 The universal premium assistance approach is shown as a horizontal line, because all beneficiaries receive the same assistance regardless of income. The green means-tested schedule slopes down, because high income people receive less assistance than low-income people. An alternative approach would be to keep the universal assistance but help pay for it with an additional 10 percent income tax on people 65 and older. 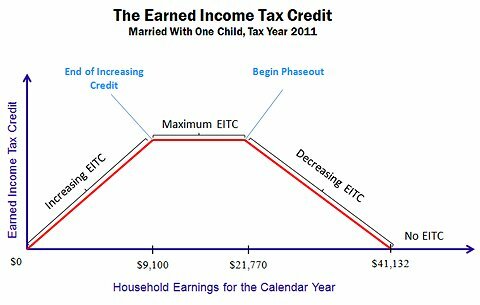 A 10 percent income tax on incomes below $110,000 a year is shown in red in the chart. Democrats have proposed raising taxes on wealthier Americans to avoid deeper spending cuts, though none have called for a tax on the elderly, as in this hypothetical example. Under the income tax version, the net benefit to beneficiaries is the difference between the blue and the red lines in the chart, which coincides with the green means-tested proposal. Although the new tax and cut-by-means-test proposals sound different – the former proposal raises revenue without cutting spending while the latter proposal cuts spending without raising taxes – they are economically equivalent in these examples. Both proposals cut net benefits (or raise net taxes) more for higher-income beneficiaries than for low-income beneficiaries. Putting more of the burden on higher-income beneficiaries is sometimes described as fair or equitable, but it also adds to the penalty for having a high income and, equivalently, subtracts from the burden of having a low income. That results in more people with low incomes, because incomes are determined in part by effort, which is affected by costs and benefits. My point here is to advocate equity rather than incentives and to point out that both proposals — tax increase and spending cut — can increase equity and reduce incentives, in much the same ways. Despite the economic similarities between the two approaches, I expect Republicans and Democrats to continue to differentiate their policies excessively, with Republicans arousing taxpayers over Democratic plans to raise taxes and Democrats alarming beneficiaries about imminent cuts in important social programs. The Department of Agriculture’s food-stamp program, now known as the Supplemental Nutrition Assistance Program, or SNAP, was originally intended as a program for the poor. But it has transformed itself into an important source of support for the unemployed. Traditionally, food-stamp program participants were subject to an asset test – households with a total of more than a few thousand dollars of assets in their bank accounts, automobiles and other assets were not eligible even if income was zero. In this way, food stamps had a lot in common with Medicaid and other antipoverty programs. The welfare reform of the 1990s also required able-bodied adult food-stamp recipients, without children, to be working or enrolled in a job-training program, or their eligibility would be limited to a few months. For these two reasons, the food-stamp program had little in common with unemployment insurance, which offers weekly cash benefits to people who have lost their jobs and have been unable to find and start a new job. Unemployment insurance has no asset test; even people with money in the bank can receive benefits from the program, as long as they have been laid off from a job and continue to look for a new one. Unemployment insurance also has no work requirement. Indeed, it has just the opposite – a person going back to work has his or her unemployment benefits terminated. As a result of the very different eligibility rules for the two programs, a vast majority of people receiving unemployment insurance were not receiving food stamps. By my estimates, only about one-quarter of households with a head or spouse unemployed were receiving food stamps in the early 2000s. But the food-stamp eligibility rules have changed markedly in the last several years, bringing the program closer to unemployment insurance. Food stamps effectively no longer have an asset test. States have also received waivers from work requirements during the recession (for a while, the requirements were waived nationwide by the 2009 stimulus law). As a result, food-stamp participation is now more common among the unemployed. I constructed the chart below from Department of Agriculture quality-control data on the activities of non-elderly food-stamp recipients back to 2000 and from Census Bureau data on the prevalence of unemployment among the non-elderly population. The former source gives me the number of non-elderly household heads and spouses who are both unemployed and receiving food stamps for their households, and the chart shows their number as a share of the total unemployment among non-elderly household heads and spouses. The ratio was about one to four in the early 2000s and actually fell during the 2001 recession as unemployment increased more than food stamp participation did. The ratio rose in the mid-2000s as states relaxed their eligibility rules and again in 2008 as the federal government relaxed its rules. 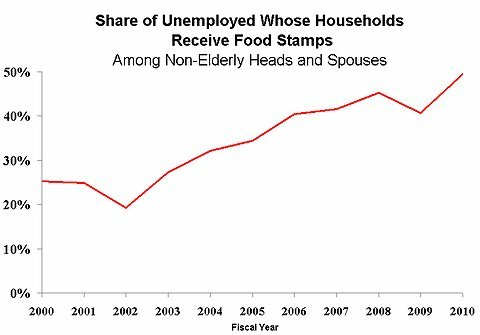 By the 2010 fiscal year, half of non-elderly households with an unemployed head or spouse were receiving food stamps. Meanwhile, the eligibility rules for unemployment insurance are scheduled to tighten this year, as the federal government puts shorter limits on the length of time that people can receive benefits. Thanks to the waivers cited above, food-stamp participation effectively has no time limit. I expect that soon the food-stamp program will support more unemployed households than unemployment insurance does.